Ultra Liquors offers customers a variety of premium liquor products at affordable prices. They were established in 1985 and supply over 1000 businesses with quality alcohol. Ultra Liquors have many accolades to their name and were voted the best liquor store in the country by the Star newspaper. They were also voted as one of the leading liquor retailers in SA by volume by the AC Nielsen research firm. Furthermore, Ultra Liquors have been awarded by the DTI as being one of the major players contributing to economic growth and job creation in South Africa. Ultra Liquors have established more than 30 successful liquor stores throughout SA. Spirits and Shooters: A wide range of spirits are available at Ultra Liquor stores including vodka, gin, rum, premium whiskeys, amarula, baileys cream as well as a range of shooters such as sambuca, tequila, jagermeister, potency, tang sours and many others. Beers and ciders: A wide range of beer products are available at Ultra Liquors including Castle, Windhoek, Guinness, and many more. Furthermore, they stock a wide range of South Africa’s favourite ciders such as Hunters dry, Hunters gold and Savannah. 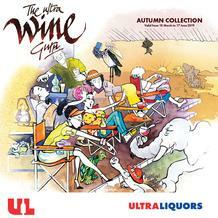 Wines: Ultra Liquors has a wide range of wines available for every occasion. If you are into red, white, sparkling wine, dessert wine or other, they will have it all. Furthermore, Ultra Liquors offers a ‘Wine Box’ special, this means that customers can choose 12 or more bottles of wine and pay for it at a reduced price, just how you would if you were buying a case of wine. Non-alcoholic drinks: Ultra Liquor stores also offer a wide range of non-alcoholic drinks including appletiser, coke, fanta, sprite, sparkling water, tonic water and many more. Ultra Liquors offers a wide range of specials throughout the year on all alcohol and related products so keep your eyes peeled for that Ultra Liquors special near you! Browse Guzzle not to view Ultra Liquor catalogues online. Robinson Superior London Dry Gin, and many more (alcoholic/non-alcoholic brands) to cater for customers diverse tastes. Ultra Liquors offers customers alcoholic and non-alcoholic refreshments. 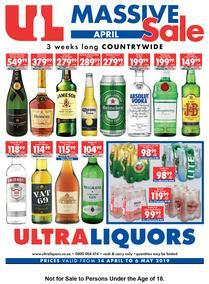 Check out Ultra Liquors deals/specials and online catalogues on Guzzle now. 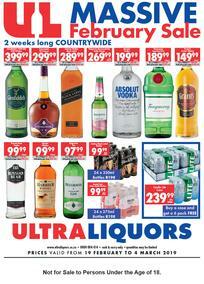 Ultra Liquors deals/specials are on offer for customers at very competitive prices. All Ultra Liquor deals are valid for a certain period of time while stock lasts. All alcoholic beverages are only on sale to persons 18 years and older. The Ultra Liquors value card allows customers to earn points and cash rewards on all purchases made at any Ultra Liquors store countrywide. Customers should have this card because it will allow automatic entrance into competitions. 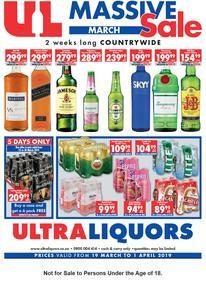 So visit your nearest Ultra Liquors store to take advantage of this exciting opportunity. So browse through Guzzle for the latest Ultra Liquors deals/specials in your area.